Pumpkin season is around the corner, so we created a cute pumpkin door decoration out of decorative poly mesh and an orange work wreath form. 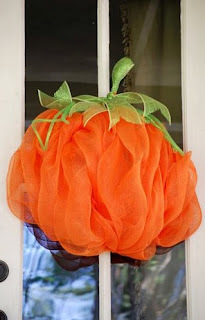 This wreath/door decoration was super easy to make and would be great for fall or Halloween. I hope it inspires you to make a pumpkin of your own. 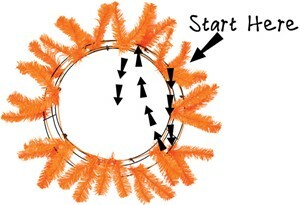 TIP: A work wreath form is a wire form that has tinsel wire ties attached. 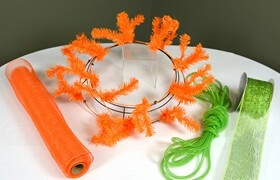 The tinsel ties are used to attach whatever medium you are using to create a wreath (orange deco mesh). The wreath form has two rows of ties. When creating a standard wreath you start on the inner ring and work outward. For this project, we are mainly using the outer ring. You will be adding the mesh in a zig zag pattern from top to bottom instead working around the wreath. For more information on using a wire wreath form in the standard format, see our video tutorial: Work wreaths work miracles for crafters. Start with the wire wreath form in front of you. There are 10 ties on the outer ring of the form. Imagine the round form is a clock. Start in the 2 o'clock position. Gather the end of the orange deco mesh and place it in this tie. Twist the ties together to secure the mesh in place. Tuck the cut end of the deco mesh into the center of the form to hide. Move down the deco mesh approximately 1 foot and gather a section in your hand. Gather from each side to achieve fullness. Skip the side tie (3 o'clock position). Attach the gathered section into the 4 o'clock- wire tie. Adjust and puff the mesh as you go. Gather a section of orange mesh approximately 1.5 feet down the roll. Adjust your length as needed to get the fullness you want on the pumpkin. Twist this gathered section into the wire tie at the top. Remember you are moving across the wire form from top to bottom-right to left. Adjust and fluff the mesh so it puffs out and sideways- aiming for a pumpkin shape. Continue across the wreath form- up and down between wire ties. 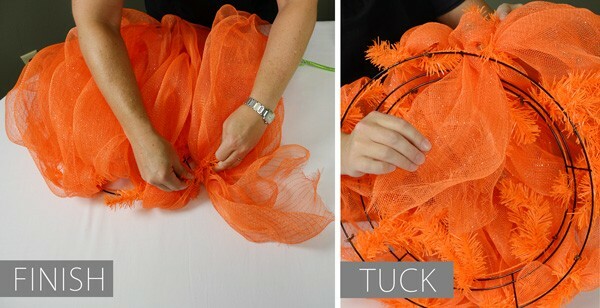 Adjust the length of mesh as needed to make the pumpkin fuller in the middle. Once you reach the other side, attach you mesh into the last wire tie. Tuck the remaining end piece into the back of the form to hide. 1. Cut a piece of 4" ribbon approximately 2 feet long. 2. Trim the ends into a clean shape- we used an inverted V cut. 3. Fold the ribbon in half. 4. At the top, roll the ribbon into a tube. 5. Using a piece of deco flex tubing in a coordinating color, tie the curled end to secure. This will form the stem of our pumpkin. 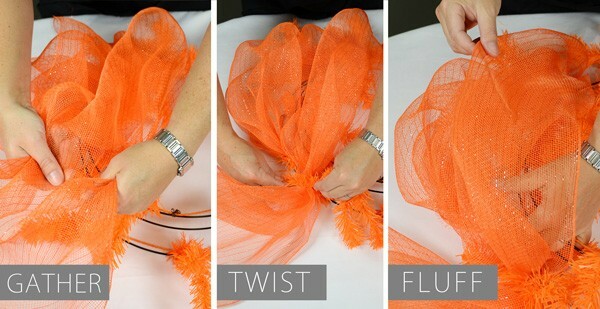 Fluff the orange mesh, vines and stem as needed. Be sure to tuck in any tinsel ties that are visible. Your pumpkin is complete. 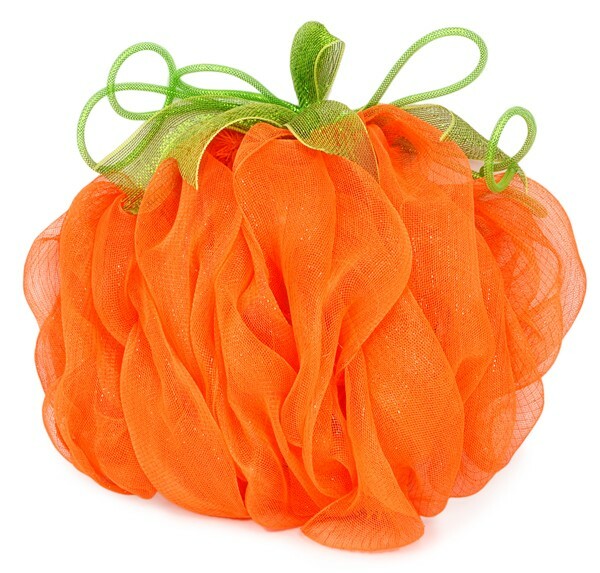 Cute, inexpensive, lightweight, weatherproof and will not rot- what else could you ask for in a pumpkin? One last idea: cut out Jack-o-Lantern eyes, nose and mouth; pin onto the deco mesh. Your fall pumpkin will transform into a Halloween jack-o-lantern. What fun! Just made one tonight. So very easy and oh-so-cute! Now I just can't wait for October! Thank you for the idea!!!! 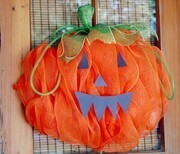 Do you know how to make the pumpkin wreaths with the little curls of deco mesh ribbon, I saw one on etsy. I am glad you liked the tutorial. This pumpkin wreath is one of my favorites! 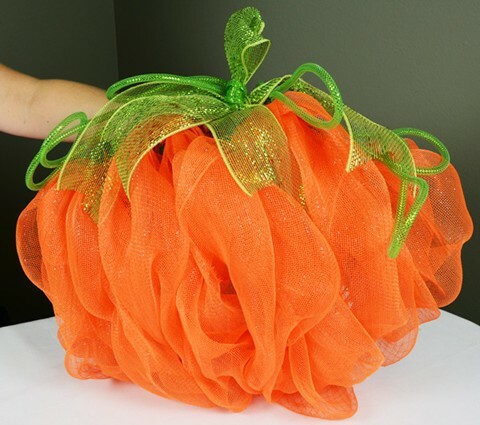 The other style pumpkin with curls that you are asking about is created with pieces of mesh instead of one continuous line. Cut small pieces of mesh (about 12 inches). The pieces will curl up into a roll naturally. Gather them in the middle. Fold in half. Then either anchor to a work wreath form or glue the gathered spot onto a round piece of Styrofoam. Aim for longer pieces in the middle so you get the rounded pumpkin shape. Anyone interested in a tutorial on this method? Just made one today. LoVe it! I am interested in a tutorial of how to make the pumpkin wreath with the curls. I also saw the one the other person was talking about on etsy, but don't know how to get it to look like a pumpkin. I am not sure that one looks like the pieces were folded in half and either glued or secured down. They look like they are just attached from the ends. Any help would be appreciated. Wish these projects would come in kits. I used all of the mesh making it very thick (wanted it that way) using all of the ties. I started with the center ties, then went over the top with the next row. Lots of ribbon & tubing left over. Your pumpkin turned out great. Thank you for sharing the picture! As for the way to create the other pumpkin with curls- I will see if I can figure out how to create that version. I will keep you posted on that one. Oh I hope you figure out how to make the curly one, I was the one who asked for help earlier! I have my supplies ready, just don't have a clue where to start! Just wondering if you had figured out a way to make the pumpkin using the curls? I'll keep checking! Is one roll of mesh enough for two pumpkins or do I need 2 rolls? You will need two rolls for two pumpkins. I am not sure why your is not as full. What kind of mesh are you using to fill the form? Try bunching the mesh instead of laying it flat. The gathered look helps to hide the form.